If you’re looking for a boat to scoot around in on Saturdays, fun family racing, or just to find a good gunkhole for a quiet family outing, the Pearson 30 may be your boat. It seems clear this is what Pearson had in mind, a little family cruising boat or day sailing in a boat that could accommodate four comfortably and beat the pants off the competition from time to time. Pearson Yachts introduced the Pearson 30 in 1971 and ended production in 1981. In that period of time more than a 1000 boats were produced with more than 400 of them being built in the peak production years of 1973 and 1974. 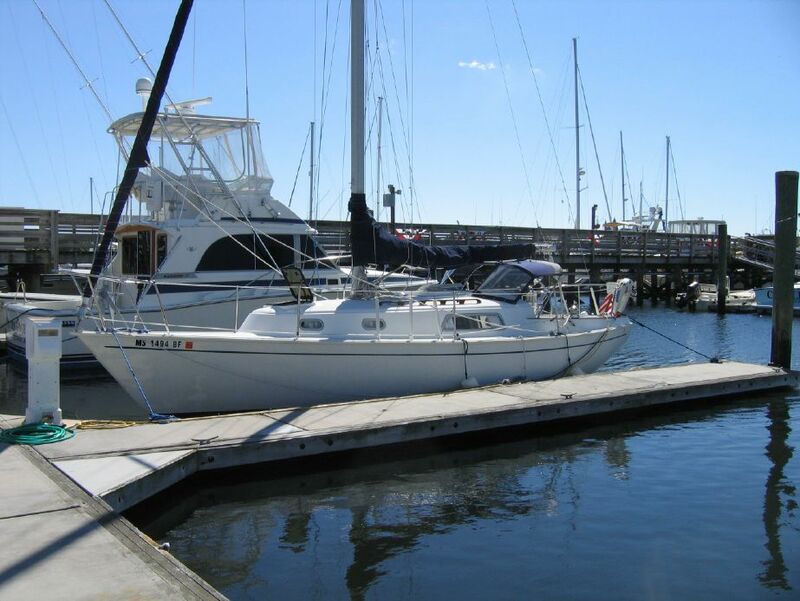 Hundreds of Pearson 30s are still sailed on the Chesapeake, often by original owners, and many can be found for sale at very reasonable prices. The hull of the Pearson 30 is constructed of hand-layup fiberglass material and polyester resin, reportedly, with an average thickness of .29" below the waterline and .21" to the deck edge. Decks are a balsa-fiberglass sandwich. Ballast is 3,500 lbs. of lead molded into an integral keel. As with any fin keel type vessel, attention should be paid to the area of the keel/hull intersection to ensure there is no damage from significant grounding. The hull-to-deck joint on the P-30 is an external flange with the two components glassed together and then mechanically fastened with stainless steel, sheet metal screws. This is a method of construction that is particularly prone to damage from impact with piers and pilings and should be carefully inspected. Generally the Pearson 30 is constructed to good boat building standards and holds up well when properly cared for. The only consistently reoccurring problem noted with a majority of Pearson 30s is sloppy rudders that result from Pearson’s use of Delrin bushings in a fiberglass rudder post tube. Worn bushings are easily replaced without considerable expense. Through about hull number 200, Pearson used an aluminum rudder post that was prone to failure. These boats were recalled by Pearson and retrofitted with rudders with stainless steel posts. It is unlikely there are still boats with aluminum rudder posts, but it’s a good idea to check if the hull number is below 200. The Pearson 30 was an attempt to meld the attributes of racing boats with those of family cruisers, sort of like rigging a mini-van to race at Indy. This is not the easiest task but Pearson was a pioneer in the racer/cruiser concept, and racing boat design theory of her day can be seen in the raked, fin keel, spade rudder, narrow beam and angular hull form. The mast is deck stepped with an oak compression post in the cabin. The compression post is glassed into the keel. The mast is aluminum and her rig is a single spreader masthead with double lower shrouds. This was quite standard for a sloop of her size and age. The cockpit of the Pearson 30 is comfortable for four adults who are close friends. The tiller steering is likely to make them even closer friends, and there isn’t enough room for a good conversion to wheel steering. In Pearson’s effort to make her speedy, they did not neglect the interior accommodations. Headroom is about 5’10". She is easy to move about in, and the fiberglass cabin liner makes her easy to keep clean. Opening ports make ventilation easier and provide ample light. The forward hatch should not be counted on for much more than ventilation, a bit tiny. There is plenty of storage in lockers arranged all about the cabin. The head is small but functional. The galley is adequate with a self-contained alcohol stove. Originally, the Pearson 30 was equipped with the revered Atomic Four gasoline engine. Later models were propelled by a Universal, 2-cylinder diesel. Both power systems are adequate, though the Atomic Four in older boats may be nearing the end of a useful life cycle. Older Pearson 30s were fitted with gate valves on some through hull fittings. These are prone to failure and frowned upon by insurance underwriters. Any gate valves should be replaced with seacocks with good backing plates. Another bone of contention is Pearson’s use of fiberglass tubes, integral with the hull, to form the cockpit drains. No shut off device of any kind is provided. This is not in compliance with American Boat and Yacht Council standards which recommend seacock shut off devices on all through hull openings below the inclined waterline. Some insurance companies will insist on this modification, and it is not an easy or inexpensive fit. If you’re looking for a good used family cruiser that can still be competitive and fun to race from time to time, look at the Pearson 30. There are plenty of them out there. Many are in good shape, and the price can be right. Go find one and enjoy.